I remember finding an ancient copy of this book on the library shelf in the late 1990's. Because my arms were already full with other books I left it behind, writing down the name and promising myself I would come back for it. When I returned to sign it out, it was gone! - removed from the library catalogue never to be seen again. 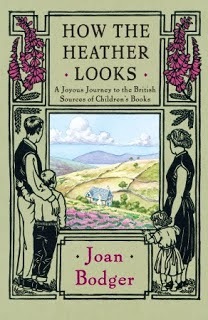 I was recently reminded of How the Heather Looks and you can imagine my thrill when I discovered that the book had been re-issued in 1999 with a new Afterword and updated Notes by Joan Bodger. Our children were so literal! They besieged us with questions. Would we see where Rat and Mole had had their picnic? Could we climb to the Enchanted Place at the Top of the Forest? Would we go down to towered Camelot? Could we pay a call on Mrs. Tiggy-Winkle? Privately we adults told each other that of course such places did not exist in reality, but the children's faith was unfaltering - and unnerving. Perhaps, we said, a few of the places really did exist. Perhaps, we said cautiously, we could seek them out. The more I read the more convinced I became that the children were right. Most places in children's literature are real. We could find them if we searched. All we needed was faith. So, the Bodgers set off on an adventure, and in her wonderfully written narrative we go along for the ride. Along with her account of the family's adventures, Joan Bodger interjects interesting and relevant research done before and after their trip which fill out the story, adding layers of information that seamlessly combine with the memoir aspect of the book. One of the most charming aspects of this story is in the quaint and simple way the family actually does its travelling. To begin, they have taken a steamer across the Atlantic from their home in America, they spend a couple of weeks living in a converted gypsy caravan by the seashore, and very nearly spend a week on a barge. It's not difficult to see why Joan Bodger has been the recipient of many requests for parenting advice, for the tone she uses when writing about her children is entirely charming. The writing was done, no doubt with no small amount of nostalgia, for by the time the book was published in 1965, her family of four had broken apart, suffering death and illness. I would highly recommend this to anyone who loves classics of children's literature, to anyone who enjoys travel memoirs, and to anyone who has children or knows children. If I were prone to rating books I would give this one a perfect score. It was worth the wait. This sounds completely charming! And as a lover of British children's lit, I'm very intrigued. Thank you for letting us know about this book! Was it worth the wait, for you? Oh yes! It was incredibly charming. You would love it, Samantha. We live about a half-hour drive from Winne-the-Pooh's old haunts, but I have to say that my children even when they were younger were not "fooled" by these places being the real places in the books. The places in the books are places in the magical imagination. My children too easily saw the difference between the "real" places in the books and the pale shadows of places that we sometimes took them to. But that's not a comment on this book, which does sound charming and interesting. Perhaps, though, it's not a useful "travel guide" to places in children's books? Hello Helen! Yes, I see what you mean, and my children are the same way. I think the reason this book works so well is that the finding of the "actual" landscapes was not the focus - it really did sound like a terrific family holiday and the literary tour was something that preoccupied the writer more than the children. She was fortunate enough to meet actual writers (Arthur Ransome), and their family members (wife of A.A.Milne). Something that intriqued me was that she had to seek out all these spots herself - there were no national historic sites to point them out for her. Her research with the actual texts was complimented by biographies and autobiographies and chatting with locals to piece together clues. The really magical part for her son (I think he was 7? - I've returned the book to the library and can't confirm) was their search for all things Arthurian. You could really sense how moved and convinced he was. There are no maps or even really concrete information for following their path. It is not a travel guide, but a record of their own personal experience. I think you would enjoy it!